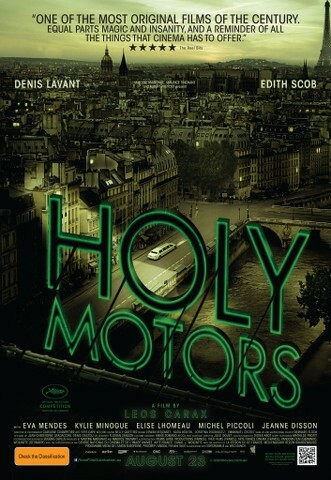 “Holy Motors,” from the French filmmaker Leos Carax, is a dream of the movies that looks like a movie of dreams. It is a reverie that begins, appropriately, with a seated audience waiting in the dark (like us) and then cuts to a dimly lighted room, where a man (Mr. Carax) rises from a bed that he shares with a dog. He lets the sleeping dog lie (no need for trouble just yet) and creeps over to a mysterious door hidden in a wall. With a strange metal key that’s apparently grafted to one of his fingers, he unlocks the door and — like Little Nemo tumbling into Slumberland, Dorothy crossing over the rainbow and Alice falling down the rabbit hole — leaves one world for another. That world is full of laughter, horror, rapture and eddies and swells of despair. It’s an episodic work of great visual invention — from scene to scene, you never see what’s coming — that reminds you just how drearily conventional many movies are. You want three acts? How dull. A pretty protagonist? Oh, please. The triumph of the human spirit? Go away. Mr. Carax has nothing for you. What he has are weird tales; beautifully whirling, gyrating bodies; an anguished song, a sense of drift and the steady (heart) beat of lament. And still, you ain’t seen nothin’ yet: at one point a diabolical creature crawls out of a Paris sewer, bites off a woman’s fingers and then licks Eva Mendes’s bare underarm, painting her creamy skin red with his tongue. Ms. Mendes, as a fashion model kidnapped from a shoot, scarcely seems to notice. She comes across as an almost indifferent damsel in distress, even after a sly wardrobe change, and she’s one of several characters or types who circulate throughout, sometimes briefly. 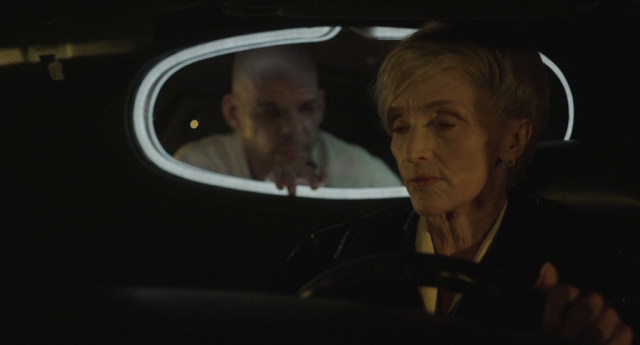 The most important of these is a chameleon of a thousand faces played and sometimes just pantomimed by Denis Lavant. An extraordinary physical specimen, with a lumpy, pockmarked mug suggestive of volcanic stone and a body that’s jumpy with sinew and muscle, Mr. Lavant has appeared in most of Mr. Carax’s movies, including as an acrobatic fire eater in the 1991 gorgeous swoon of a film “Les Amants du Pont-Neuf.” Here Mr. Lavant plays male and female, old and young, the living, the dying and the dead. Mr. Oscar is a man on the move and, you discover, a man of movement, motion and moving (as in pictures). After chattering into a phone, like a regular master of the universe, Mr. Oscar begins busily transforming himself in the back of his now improbably spacious limo crammed with boxes, bric-a-brac and a dressing room mirror. When he emerges a few beats later, for the first of his multiple, magical metamorphoses, he looks like a shriveled old woman and almost unrecognizable. Bent over, he wobbles along the bank of the Seine, tapping a cane and muttering, as if to himself, instead of the bodyguards trailing him. He ends up shaking a beggar’s tin on a bridge, ignored by the passers-by who surge around him like a pitiless current. Within minutes she has disappeared into the limo, and Mr. Oscar is on the move again, scanning another dossier for what he and Céline cryptically refer to as appointments. The nature of these appointments and his role(s) in them are an abiding, beguiling mystery. Mr. Carax never explains his intentions — and why Mr. Oscar appears like a demon in one scene and a mustachioed baldie with a knife in the next — leaving you to piece together meaning, or meanings. All movies demand interpretation, but Mr. Carax doesn’t seem interested in your solving his puzzle, which allows you to solve it as you like. About all that’s clear is that Mr. Oscar works for an entity, perhaps God, which also makes this a movie about filmmaking and the ecstasy of creation. It’s a gift for moviegoers to have this much freedom, and exhilarating. 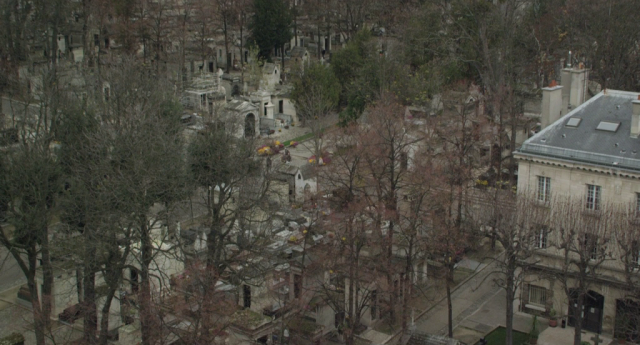 In “Holy Motors” you never know where Mr. Carax will take you and you never know what, exactly, you’re to do once you’re there. Sometimes you may be amazed or delighted; other times, you may feel restless or uninterested. No matter: there’s always another new vision coming up. If that sounds confusing, it isn’t. Although the movie doesn’t have an obvious narrative through line, its episodes are nonetheless deeply connected by mood, visual style and Mr. Lavant. They are connected, in other words, by Mr. Carax’s singular, fluid artistic vision. 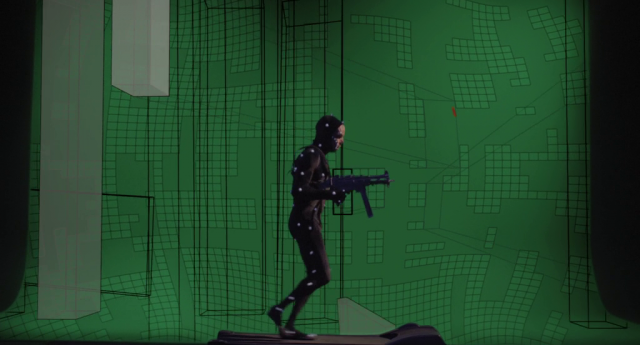 And while at times it feels as if “Holy Motors” had been cobbled together from a million movies, it mostly, wonderfully, feels unlike anything else: it’s cinema reloaded.